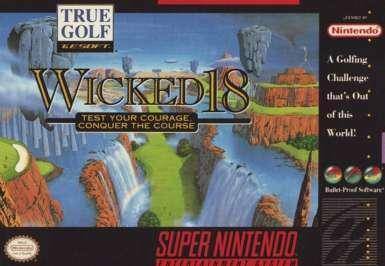 Wicked 18 for Super Nintendo allows you to face soaring mountains, deep canyons, and mysterious objects. Take on the course by yourself or become a foursome with three of your friends. Four different play modes--Stroke, Match, Skins, and Tournament-- offer unique challengers for the course. After every round, battery backup saves your progress and statistics.